When you have belonged to an organization for most of your life, it isn't always easy to remember your first impressions. But for the women of the Flora Stone Mather Alumnae Association, this rarely seems to be a problem. The story of their involvement is one they love to tell from the beginning, and the details have only gained significance with the passage of time. Dorothy Mitchell Zanetti, for example, started attending the association's annual meetings soon after she graduated from Flora Stone Mather College in 1959. Each year, the class celebrating its 50th anniversary would present a gift, usually for scholarships. To a brand-new alumna, those women seemed "really, really old." But then, Zanetti says, "I would look at them and think: They're so active, and they're so smart, and they're so curious. And when we would have teas or luncheons or whatever, these women would come. And they were just filled with knowledge of the contemporary times, even though they had graduated 50 years before." Zanetti didn't know it then, but the elder generation of Mather alumnae would become her role models. "I have always felt that educated women continue to be active in the world," she explains. "I think that we are involved in a lot of things outside of our own little families." Looking back to her college years, she adds, "I think the type of education we had at Mather was conducive to opening our minds to what was going on in the world—and that just continued. People say we had such limited options. Well, maybe we did have limited options, but we didn't have limited thinking." For 114 years, the members of the Flora Stone Mather Alumnae Association have been proving Zanetti's point. But now, it has fallen to the women of her generation to bring the group's formal history to a close. In June, 260 alumnae gathered at Squire Valleevue Farm for the association's last annual meeting. By some unspoken compact, everyone agreed this would not be a somber occasion. Members of the Class of '47 presented a musical revue, as if they were reviving a Stunt Night performance from 60 years ago. Women who had never attended an annual meeting mingled with women who had never missed one. Meanwhile, the board members who had spent years preparing for this day remained focused on the task at hand. President Sandra Malek Vodanoff announced parting gifts to several university programs. Patricia Baldwin Kilpatrick called for donations to the association's final campaign: a $1 million challenge grant to endow the Flora Stone Mather Center for Women. Near the entrance, Harriet Rosenthal Gould, the association's treasurer, had been distributing place cards, and she lingered there even after the presentations started. "Everybody's crying," she confessed. "But it's good to go out strong." 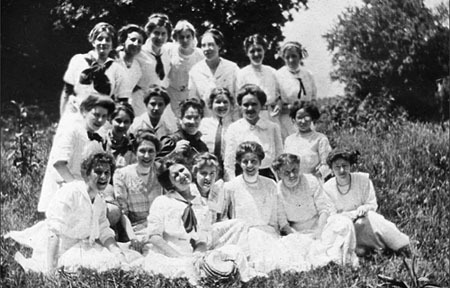 The history of the association began on February 24, 1894, when five graduates of the Cleveland College for Women at Western Reserve University met and started making plans. (This was only six years after the college itself had been created; it wouldn't be named for Flora Stone Mather until 1931.) The association's first social event was a commencement banquet for the Class of 1894. Three years later, the alumnae established a scholarship fund with $210 in proceeds from a theatrical performance of The Russian Honeymoon. Soon, the Mather women were supporting efforts to develop the college's physical infrastructure. In 1907, they contributed $17,500 toward the construction of Mather Gymnasium. A few years later, a future association president, Ruth W. Hitchings, led an $80,000 campaign to build the Mather House dormitory. The great Cleveland philanthropists of the day—Rockefeller, Severance, Wade—answered her solicitations with $5,000 checks, and many alumnae made substantial gifts as well. Yet the association has never relied solely on large donations. A ticket to the formal opening of Mather House on May 22, 1914, cost 25 cents. There were baked goods and jellies for sale in the kitchen, flowers and homemade candies in the dining room. Guests were also invited to help furnish the kitchen by covering the cost of the utensil of their choice. This was the Mather way of doing things. And if you look closely enough, you can find evidence of it even in the alumnae's grandest initiatives. In February 1929, for instance, the association announced a $1 million endowment campaign. The speeches at the opening banquet were broadcast live over radio station WHK. The Cleveland News reported, a bit condescendingly, that "750 of the girls and 'old girls' ... met to eat, make merry and usher in their campaign." In no time, however, the "girls" mobilized more than 500 volunteers. By April 10, they had secured almost $663,000 in pledges; by mid-October, they were just $60,150 short of their goal. Then the stock market crashed, marking the start of the Great Depression. We've reached our goal in ten short months. The spring offensive began on February 15th—and what a series of attacks and counter-attacks, skirmishes and ambuscades followed. We've proved old friends and discovered new ones; we've learned many a lesson in loyalty and puzzled over many a problem of indifference. We've talked and walked and slept and dreamed "endowment"; we've sold rubbers [erasers] and rolls of waxed paper and playing cards; we've baked and preserved, and tended babies—and had such a jolly time withal! This is an aspect of women's philanthropy that the Cleveland News did not fully appreciate. Naturally, the alumnae made merry at banquets: That's part of what an association is for. But once the festivities ended, the Mather ladies worked. And only the tiniest fraction of their efforts ever made it onto the radio or into any annual report. As general chairwoman for the association's current $1 million campaign, Pat Kilpatrick draws inspiration from the women of 1929. But she takes equal pride in the seemingly endless array of activities that have filled the alumnae's calendars ever since: "Poke 'n' Tote" flea markets in Haydn Hall, lectures and recitals, awards ceremonies, conferences and symposia. "You see," Kilpatrick says, "the Mather Alumnae Association is not just leaves in a teacup." She speaks as though she's been waiting for an opportunity to set the record straight. The Mather alumnae have pledged $5 million in final gifts to the university. This amount represents the proceeds from their current campaign as well as the endowment they have accumulated over decades of fund-raising, donating, and investing. Approximately $2.6 million of their pledge has been designated for a scholarship fund. Another $1 million has been set aside for the challenge grant: It will be used to match contributions to the Flora Stone Mather Center for Women until May 2012. Out of their remaining funds, the alumnae are making gifts that affirm several of their longtime commitments—to the performing arts, women's athletics, Squire Valleevue Farm, and the study of women's history. It is no surprise that half of the pledge will go toward scholarships; student aid has always been one of the association's priorities. As early as the mid-1930s, branches in Boston, Pittsburgh, Akron, and Canton had created their own scholarship funds. In the 1940s, the association hosted benefit recitals in Cleveland's Public Music Hall, with soloists such as the Metropolitan Opera's Risë Stevens and film star Jeanette MacDonald. The proceeds from these events were initially invested in war bonds. But as soon as the bonds matured, the money went into the scholarship fund. Down through the years, individual alumnae and reunion classes made their own contributions. "I was so proud of my classmates," Mary McGuire Eitzen recalls, "when we successfully raised the required $20,000 to establish the Flora Stone Mather Class of 1950 Scholarship Endowment Fund." Beyond providing support, however, the alumnae always wanted to know the scholarship students. For most of their history, they selected the recipients and held an annual dinner in their honor. In addition, the association sponsored several programs for the benefit of undergraduates in general. These included a seminar series, "Backpack to Briefcase," examining the transition from college to the workplace, and formal banquets where the Mather alumnae would dine with students and "critique their etiquette." As quaint as that may sound, Zanetti says the dinners were a great success: "We had a lot of foreign students come, and they were very interested in learning American ways. They would also criticize them, sometimes; they didn't understand why Americans keep shifting their fork from one hand to the other." In 1994, Kristen Manter, president of the Association for Women Students, invited the association's board members to tea so that the two generations could exchange stories about their undergraduate experiences. The students were amazed by all the rules and restrictions that governed life in a women's college four or five decades earlier. For their part, the alumnae were surprised to learn that the female students often felt isolated from one another and from other women on campus. There were no spaces or social structures to bring them together—a stark contrast to Mather College. The students also described challenges they faced at an institution where women were very much in the minority. The alumnae had expected to hear how much better things were for the young women of that day. Instead, they became aware of the students' frustration. From then on, the Mather alumnae assumed a leadership role in founding a center for women at the university. They sponsored a major colloquium, "Woman 2000: Forging a Vision," to promote changes in the culture of the university with respect to women's issues. The Class of 1956, led by Barbara Dale Collins and Roma Cohen Aronoff, celebrated its 45th reunion by starting an endowment fund to support the center's creation. And in 2003, when the center opened, the association made a naming gift of $500,000. Now, having pledged $1 million to endow the Flora Stone Mather Center for Women, the alumnae are busy raising funds they will match with their challenge grant. Flora Stone Mather College graduated its last class in 1972. The following year, the university consolidated Mather, Adelbert, and Cleveland Colleges into Western Reserve College, the immediate predecessor to today's College of Arts and Sciences. But the Mather association did not dissolve or scale back its activities. Instead, it launched an endowment campaign for a new visiting professorship that eventually brought 32 distinguished women scholars to campus. Over time, the alumnae decided that the endowment should support a permanent faculty member, and political scientist Karen Beckwith joined the College as the Flora Stone Mather Professor in 2006. Since the 1972 consolidation, the alumnae have found many ways to keep Mrs. Mather's name alive. But more than anything, they have tried to remain faithful to her example. Not long ago, the board members learned that the Goodrich Gannett Neighborhood Center on East 55th Street was raising money for renovation and expansion. They knew all about the original Goodrich building: Mrs. Mather financed its construction as Cleveland's first settlement house in 1896, and for years afterward she covered its operating expenses. More than a century later, the Mather women gave $50,000 to Goodrich Gannett's capital campaign; and then, since they have never been content to put up a mere shell of a building, they donated artwork and 200 children's books for the library. The Flora Stone Mather Early Childhood and Family Service Center was dedicated on August 21, 2007. It wouldn't be the colorful, inviting place that it is if the alumnae association had disbanded any sooner. A distinctive group of scholarship students have equal cause to be grateful for the association's longevity. Beginning in the late 1990s, the Mather alumnae decided to devote their aid to non-traditional students, including women returning to school after years in the workforce. The Mather scholarships provided a much-needed supplement to the financial aid these students were eligible for. At the same time, those selected as scholarship winners felt affirmed in their decision to attend a university that might once have seemed beyond their reach. Finally, the Mather alumnae say that remaining on the scene has allowed them to enjoy a special privilege: They were on hand to greet and build a relationship with the university's first woman president. Barbara Snyder attended their farewell meeting, and she gave the keynote address at this fall's Women of Achievement and Mather Spotlight Luncheon. "One of the great pleasures of my first year as president has been getting to know the alumnae of Flora Stone Mather College," President Snyder says. "These graduates are passionately committed to the university and to serving the women who have followed them on our campus. They've contributed to so much progress here, and I look forward to their continued engagement." Sharon Jordan-Davis, the College's executive director of constituent development, has been interacting with the Mather alumnae for more than a decade. "When you look at the breakdown of groups within the College, the Flora Stone Mather group probably has the highest participation," she says. "And I know it's a direct result of the experience they had here as students of the women's college. It was just ingrained in them that this is something you do: You give back." Patricia Kilpatrick adds that the college gave these women the practical experience they needed for the tasks ahead. "We had our own student government," she recalls. "We had our own clubs and associations, and the students ran them. Every club in Mather College had an account at National City Bank. So we learned how to manage organizations. We learned how to work in the world." Kilpatrick went on to have a groundbreaking career at the university—as a dean of women, as faculty secretary, and finally as the institution's first woman vice president. But she still remembers entering Mather College as a transfer student in 1947. "I lived at home," she says, "but I had had that going-to-college environment, and I fell right into it here. I'd sit in Haydn Hall and play bridge; we had a bridge game that never ended. Somebody went to class, and somebody else sat down." It sounds like the strategy that kept the alumnae association alive for 114 years. Many thanks to university archivists Jill Tatem and Helen Conger; to Jacqueline Greene, a recent graduate of the College who researched the history of the Flora Stone Mather Center for Women; and to Richard Baznik, director of the Institute for the Study of the University in Society, for their contributions to this article. 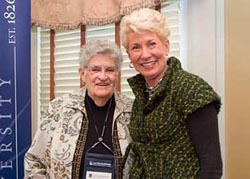 Patricia Kilpatrick (left) and Lydia Bruner Oppmann celebrate the legacy of Oppmann's mother, Pauline "Polly" Bruner, a Mather alumna who served as a university trustee. During Alumni Weekend, the association dedicated the Flora Stone Mather Living Room in Alumni House to Polly Bruner's memory. The Mather alumnae held their final annual meeting in the sheep barn at Squire Valleevue Farm this past June. The goal of the Challenge Grant campaign is to raise $1 million for the Flora Stone Mather Center for Women. The leaders of the campaign are Susie Gharib, co-anchor of the PBS Nightly Business Report; Mary Ann Jorgenson, a university trustee and a partner at Squire, Sanders, & Dempsey; and Patricia Baldwin Kilpatrick, a member of the Mather alumnae association's board of directors and a former vice president of the university. Under the terms of the Challenge Grant, the Flora Stone Mather Alumnae Association will match every dollar raised before May 10, 2012, up to the $1 million total. While the Challenge Grant will be allocated entirely to the Center's endowment, donors to the campaign may direct their gifts either to the endowment or to the Center's operations. For more information, please contact Gary Pillar at (216) 368-3992 or gary.pillar@cwru.edu. 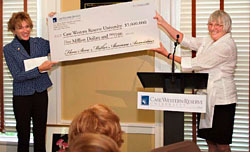 University President Barbara Snyder (left) and Association President Sandra Vodanoff display a ceremonial check, representing the Mather alumnae's $5 million commitment to the University.